When it comes to the Israeli martial arts few people are as well versed as Jim Wagner. He has studied Krav Maga, HISARDUT, KAPAP, and LOTAR. Not only that, he has been a guest instructor allowed to train the Israeli Border Police, Municipal Police, and the Israeli Army; one of the few foreigners allowed to do so. 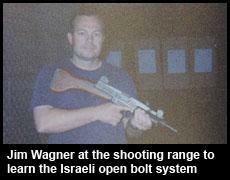 Of course, the training Jim Wagner gave to the Israelis was his very own Jim Wagner Reality-Based Personal Protection system; although it would not be officially called that until 2003, but it was essentially the same material. 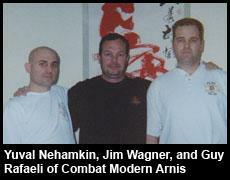 Jim Wagner has written several articles on the Israeli martial arts, and was the first person to bring KAPAP out of Israel through Major Avi Nardia. 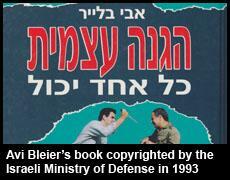 Jim�s first exposure to the Israeli martial arts was through an Israeli immigrant to the United States named Alon Stivi. He had a HISARDUT school in the City of Costa Mesa; the same city where Jim was a full-time police officer. HISARDUT (a Hebrew acronym for the word �survival�) is an Israeli system created by Dennis Hanover. Jim studied regularly with Alon for the entire year of 1998, and also had a few of his fellow police officers join with him; one of them being Sergeant Burt Santee. In 2003 Jim would have the privilege of meeting and training a bit with Dr. Hannover in Israel. 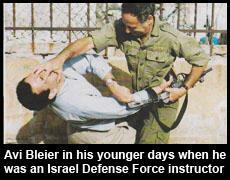 Alon Stivi had been a soldier in the Israel Defense Force and also well versed in military Krav Maga. In addition to studying with Alon, Jim Wagner also hired him to teach two courses. One was an Israeli bus interdiction course and the second was a law enforcement and military live-fire Pistol Stress Course. The shooting course was held in Los Angeles on June 22, 1998. On March 7, 2001 Jim Wagner taught at the Israel Police Operational Fitness Academy in Havatselet Hasharon, Israel through the authorization of the Academy Coordinator Colonel Gidy Lind. Wagner was invited personally by Staff Sergeant Major Avi Nardia after viewing one of Jim Wagner’s videos titled Police & Military Edged Weapons Defense produced by Budo International in Europe. 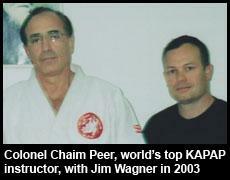 In 2001 and 2003 Jim Wagner was invited by Lieutenant Colonel Chaim Peer, the world's top KAPAP instructor, to be a guest instructor and introduce his Reality-Based Personal Protection system to his students at the Tel Aviv University. Colonel Chaim Peer served in Israel's most famous military Special Forces unit Sayeret Matkal. Having fought in two wars (1973 and 1982), and having been on numerous secret operations, he had been a paratrooper, a Combat Diving Instructor for S13 (the Israeli Navy SEALs), a rappelling instructor, firearms instructor, a graduate from U.S. Army Ranger School, and a Combatives instructor: KAPAP, Krav Maga, and Jiu Jitsu. 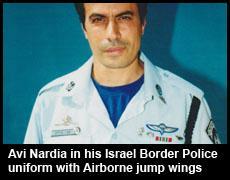 Avi Nardia started his tactical career in 1980 with the Israeli Defense Force as a paratrooper with the Tsanchanim (Airborne). In 1981 he became an officer, and in the following year he was leading troops into combat during the Israeli-Lebanon War. He remained in Lebanon for two years where he conducted missions throughout the entire country. 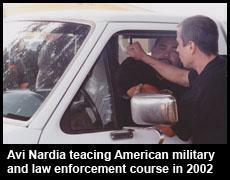 In 1984 Nardia served on the enemy borders of Syria and Lebanon and briefly on the Egyptian border. A year later he left active duty and went into the Army Reserves where he remained until 2008 separating with the rank of major. 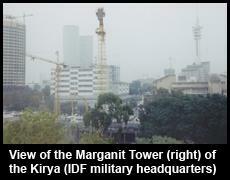 Avi Nardia told Jim, “Our knife systems in Israel are no good. Your’s is realistic. Your’s is what we are after. 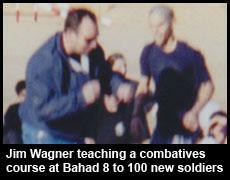 Could you come teach my unit in Israel?” Jim Wagner was quite surprised by the invitation knowing the Israelis’ worldwide reputation as fierce warriors, but apparently when it came to knife combat military Krav Maga was not working out for them. The Israel Police Operational Fitness Academy is the national police academy for the State of Israel for both the Border Police (the “Green Police”) and the Municipal Police (the “Blue Police”). Jim Wagner taught all of the Academy instructors his Knife Survival program, and many of them would spread the knowledge throughout units in Israel. In 2001 Sergeant Uri Kaffe, one of Avi Nardia's students, took me to a gun range and gave me a familiarization course on Israeli weapon systems. 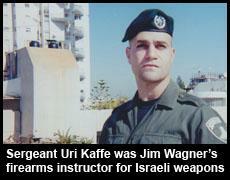 Sergeant Kaffe was in the Border Police at the time, and a Reservist in the Israel Defense Force. While serving in Jerusalem he was in a riot unit and did Arab Section Crimes. In 2003 he had become a police sniper. Segeant Kaffe, a self-defense instructor, had studied police defensive tactics, military Krav Maga, Brazilian Gracie Jiu Jitsu, KAPAP, and in 2003 became a Jim Wagner Reality-Based Personal Protection Level 1 instructor with Avi Nardia when they were in Los Angeles, California. 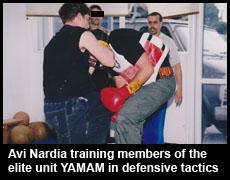 Maor Amnon, who later founded the Maor Self Defense Center, was one of Jim’s students at the academy. Maor became very popular throughout Europe. Two other of Jim Wagner’s students in the course, T.H. and S.D. (only their initials are permitted, but not their names for security reasons) each became the head of the Israeli Air Marshal program; the first was succeeded by the other. Jim did not realize the influence he had on the Israeli Air Marshal program until years later when the Dutch police, who sent personnel to Israel for training for their own program, told Jim that the Israelis credited him with many techniques that he had taught them, that were in their curriculum; most notably the Jim Wagner Knife Disarm Rule that is used to survive in confined spaces. Jim Wagner has also trained the Dutch police at the highest levels and also assisted with the German Air Marshal program. Yet, another one of Jim’s students who attended his course at the academy was D.A. (name also withheld) who became an expert instructor for LOTAR (Israel’s counterterrorism school). 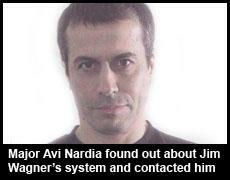 Of course, Avi Nardia was a student of Jim’s and today he is known worldwide for the original Israeli military system known as KAPAP from which Krav Maga was born. From 1985 until 1992 Avi devoted his life to the study of the martial arts in Japan, and worked as a bouncer in Tokyo nightclubs. After receiving black belts in Kendo and Ju-Jitsu he returned to his homeland and became a member of Israel�s elite counterterrorist team YAMAM (a Hebrew acronym Yechida Meyuchedet Le�Milchama Be�Terror). He served in operations, intelligence, and as a combat and defensive tactics instructor. 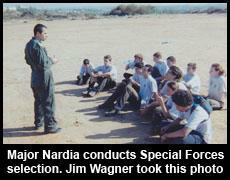 After his service with YAMAM Avi Nardia became a combat and defensive tactics instructor for the Israel Police Operational Fitness Academy; the post he occupied when he invited Jim Wagner to teach his unit with the law enforcement rank of Staff Sergeant Major (the highest NCO rank in the Israeli system) in the Israeli Border Police. A year later Avi became a Reserve police officer with the assignment of sniper. 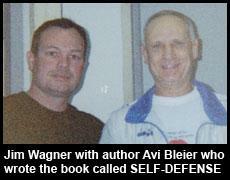 When Jim Wagner returned to the United States he contacted Avi and invited him to teach law enforcement and military personnel in Southern California. Avi accepted the invitation and on September 3, 2001 (one week before the terrorist attacks on American soil by Al Qaeda) Avi taught Israeli building clearing, tubular assault methods (aircraft, train, and bus), vehicle takedown, and the Israeli hand-to-hand combat system KAPAP. Those attending the course were personnel from the FBI, Los Angeles Sheriff�s Department, Orange County Sheriff�s Department SWAT (Jim Wagner�s agency at the time), and other local agencies. 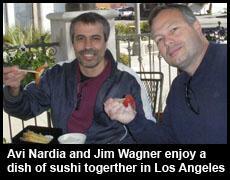 Jim Wagner again flew Avi Nardia out to California to teach three courses on February 11, 12, and 13, 2002. 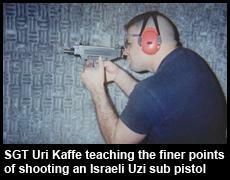 The courses were: Israeli Entry Team Tactics, KAPAP, and Combat Firearms; a live-fire course held in Los Angeles County. These courses were for local law enforcement and military personnel. 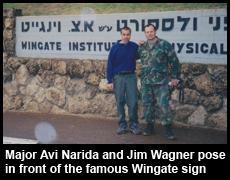 In December 2003, Jim Wagner�s third trip to Israel, he trained new Israel Defense Force recruit soldiers in Combatives at the Wingate Institute; not on the civilian side of the compound, but on the military half of the compound known as Bahad 8 located in Netanya (www.wingate.org.il). 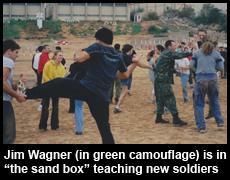 He was there by permission of Shahar, who was the head instructor of the Army�s Krav Maga training unit. Jim also assisted Major Nardia in the Special Forces selection process that they run potential candidates through. 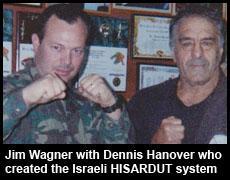 In December 2003 Jim Wagner did a little training with Dr. Dennis Hanover, the founder of the Israeli HISARDUT (Dennis Survival), and also interviewed him in Herzliya. 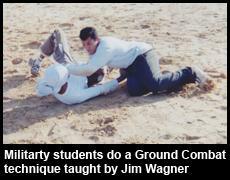 Jim was also taught by one of Dr. Hanover�s top instructors 5th degree black belt Ran Steinberg. Dennis Hanover was born in South Africa in 1937. In his childhood and adolescence he was many times targeted because of cruel anti-Semitism and he decided to fight back, which instilled in him the art of survival. As a teenager Dennis enrolled in competitive sports during the Hashomer Hatzair movement in South Africa. In 1958 he became a Judo champion of the South African team in his weight division, and then opened up the first Jewish Judo and self-defense school. In 1960 Dennis immigrated to Israel and that same year he succeeded in placing Judo as a national event in the Maccabi Games (the Jewish Olympic Games) and competed in them himself. In 1975 Dennis was on the Israeli team in the first Open Championship of Karate in Japan. 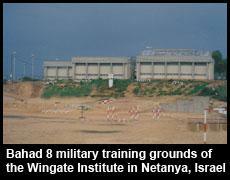 He was also a member of the Israel Committee of Martial Arts and Self Defense at the Wingate Institute. In 1983 the E.J.J.U. bestowed upon Dennis the honorary degree for his HISARDUT system and in 1993 he became a Ninth Dan and Doctor of the Martial Arts. Over the years the HISARDUT system has been taught to the Israeli military, the South African army and police, the Nigerian army, the Turkish police and civilians throughout the United States and Europe. For a few hours Jim Wagner met with Guy Rafaeli and Yuval Nehamkin of the Combat Modern Arnis system. The school had opened in February 2002 and had 30 students. Arnis was fairly new in Israel coming into the country only a decade earlier in 1991 by Moshe Elias after a trip to the Philippines. Original Guy’s background was Kiokoshin Karate and then became a student of Bram Frank, a friend of Jim Wagner, of Common Sense Self-Defense (CSSD). Jim Wagner also met with and interviewed Eli Avikzar of the Israeli Krav Magen Association. Eli was Imi Lichtenfeld’s first certified black belt and number one instructor for many years. 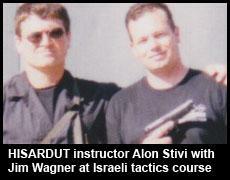 Eli Avikzar was also the instructor of American Darin Levine who began the Krav Maga craze outside of Israel. 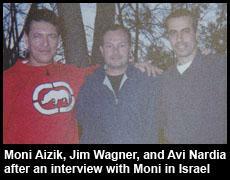 In December 2003 Avi Nardia introduced Jim Wagner to Moni Aizik in Israel. An Israeli war veteran, Moni just happened to be visiting Israel at the same time, but he was living in Toronto, Canada. Three years later Jim Wagner wrote an article about Moni Aizik and it was published in the April 2005 issue of Black Belt magazine; one of the world's leading martial arts magazine. Although Moni was a well known martial arts instructor for training Ultimate Fighting Campionship titleholder Carlos Newton and Israel's first Olympic gold medalist Yael Arad in judo, this article really launched Moni's career and made Combat Krav Maga an international system.